John Paul II received Armenian Monophysite patriarch Karekin II in the papal library. 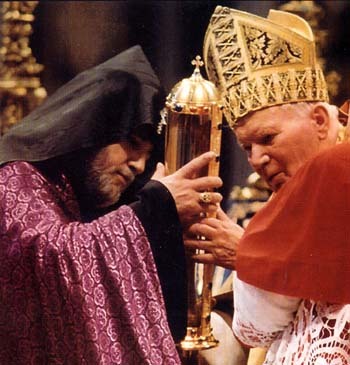 Notwithstanding his heresy, JPII handed over to him a relic of St. Gregory the Illuminator during the audience. The relic had been venerated for more than 500 years at the Cathedral of St. Gregory the Armenian in Naples. On the occasion of the visit, Cardinal Kasper congratulated Karekin for his "fidelity to his Christian faith."